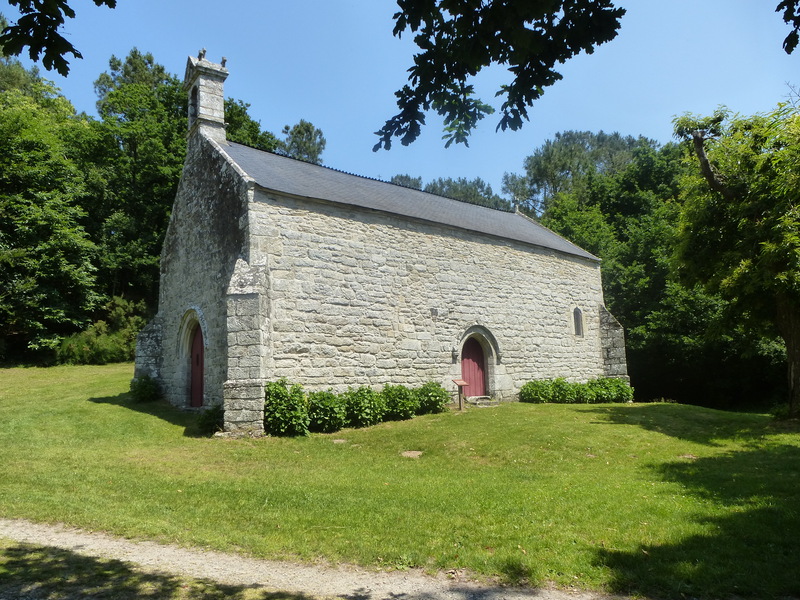 The Chapel of Saint-Clair nestles in a quiet valley just outside the Breton village of Limerzel. This is a tranquil part of the world, one that the rapid developments of the late 20th Century have largely passed by. As a result, a visit to this valley, with its collection of fascinating ancient monuments, is rather like stepping back in time. 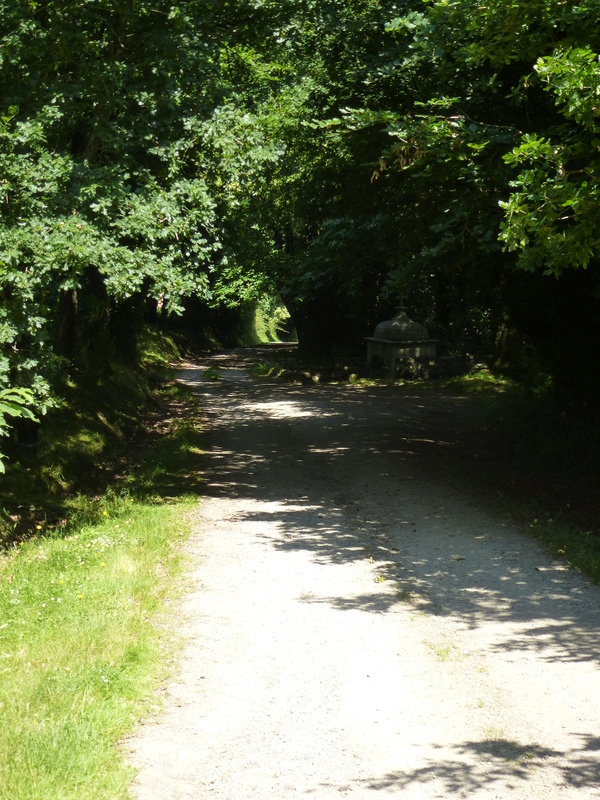 The path towards the chapel begins in a stretch of shady trees. There is a picnic table here for any passing tourists, although this is not the kind of place that attracts lots of visitors, just the odd dog walker from the village or maybe a passing farmer on his tractor. 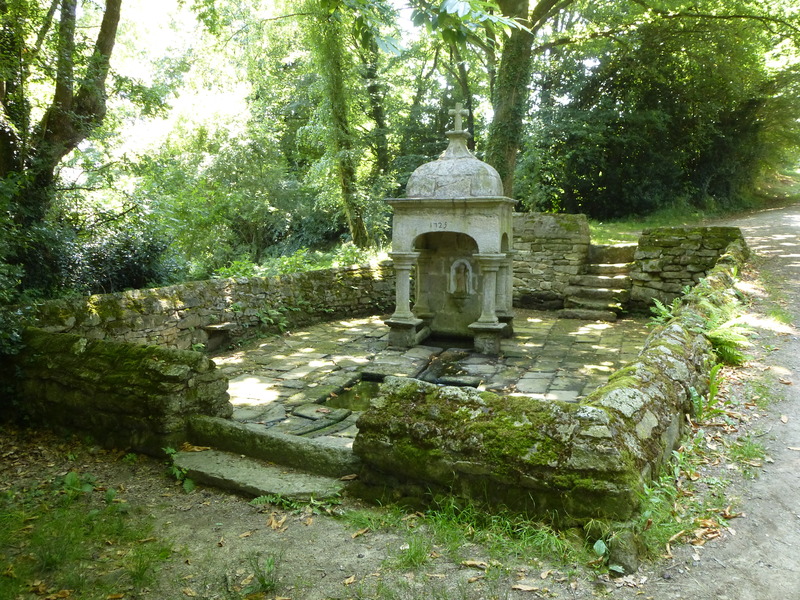 Walk a bit further down and you will find the first curiosity on this short journey, namely the Fountain of Saint-Clair. Large scale holy fountains like this were once common in Brittany, and a number of them survive to this day, but few are as decorative as this beautiful example. Saint Clair himself can be seen carved in polychrome relief below the elaborate canopy. The first bishop of nearby Nantes, Saint Clair was responsible for bringing Christianity to the region in the late 3rd Century. In the past, his fountain has been attributed with healing powers, particularly for those suffering from maladies of the eyes, although the mossy, leaf-filled pool which lies at the heart of the fountain doesn’t inspire much hope for modern miracle seekers. Follow the path a bit further and you will emerge out of the trees; take a sharp right turn and you will discover the next point of interest – the Cross of Saint-Clair. 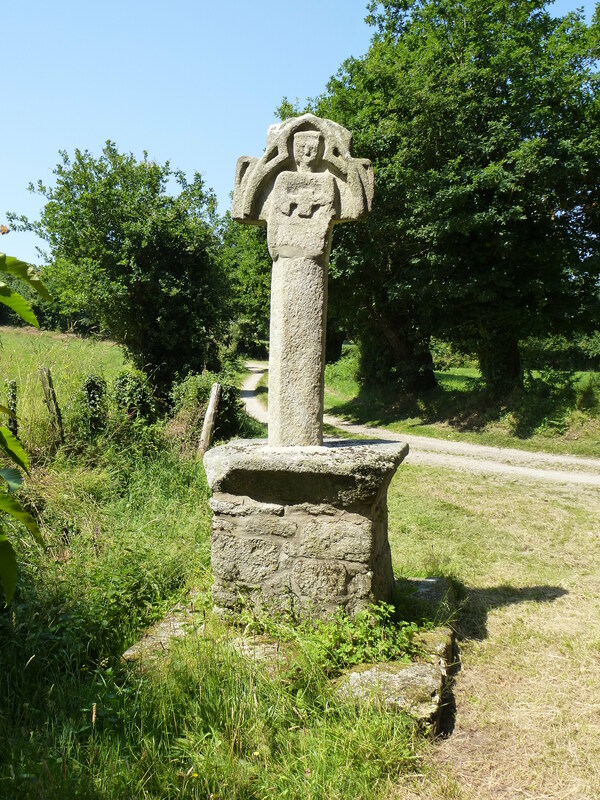 Like many of the crosses which dot the landscape in this area, the carving on this monument is provincial and naive, while centuries of erosion has erased much of the fine detail. The base is dated 1818, although the obvious age of the cross itself suggests that this date relates to a later restoration rather than its original construction. By now the chapel itself can be seen nearby. It is just a short walk across a babbling stream to the final destination of this magical pilgramage, a simple building which dates from the 15th/16th Century and was sympathetically restored during the 1800s. 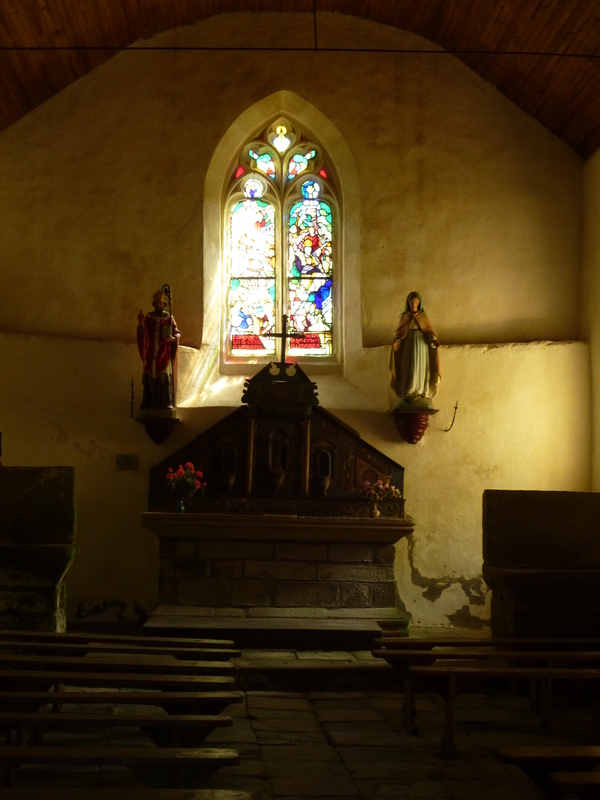 Nowadays the chapel is almost always locked, but a small grille in the door allows visitors a view into the sombre interior, its religious statues and austere furniture bathed in the golden light from the small stained glass windows. Every year on the 15th September the locals celebrate the Pardon of Saint Clair, during which a procession makes its way from the fountain, which is temporarily festooned with colourful flowers, to the chapel. After the procession everyone indulges in a communal meal to commemorate the Saint’s day. But for the other 364 days of the year the chapel remains peaceful and largely forgotten in this secluded valley, a place which still remains a magical haven far from the noise and bustle of modern life.